Kent Farndale Gallery, Port Perry. Ontario Craft Council Guild Shop, Toronto. 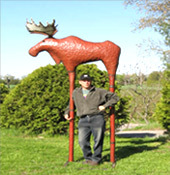 Jean Pierre's work is in numerous private collections in Canada and abroad. I use recycled materials for a number of reasons. First, it is our responsibility to contribute to this world in as many ways as possible. Garbage is a great place to start. Oil tanks are costly to cut up and recycle so the scrap yards don’t want them. I began using oil tanks, water tanks and propane tanks to save money because the steel was so expensive. I soon realized what I was doing. The recycling had become part of my life. I began to look for more items that could be recycled into my work. If it is thick enough to last for years and years then I am interested. People bring me all sorts of things. I drag things out of the ditches some times and then the earth feels better! I drain the tanks of the sludge and oil and take it to the recycling depot. There is quite a process to getting the steel ready for the sculpture. The material has a lot of character and always tells a life story. It has a lot more to say than a big, expensive sheet of new grey steel. Some tanks have many layers and colors of paint on them from being painted over the years to match houses and cottages. Some of my work involves old tools, steps from antique carriages and 70 year old manure spreaders.